The W-8 Cattle Hay Feeder is a large bale feeder that will accommodate your small calves as well as your full size cattle. 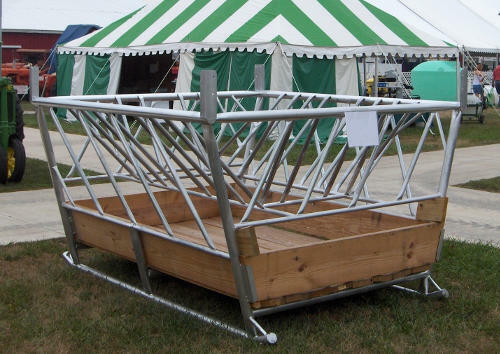 Whether you are feeding a group of feeder calves or the whole herd this feeder will handle it with maximum hay savings. The unique design on this cattle hay feeder is what makes it all possible, the bottom is narrow so the calves can reach the middle yet, the top basket is still large enough to hold BIG bales (square or round.) And believe me when I tell you that this is, ONE TOUGH CATTLE FEEDER. This feeder weighs over 100lbs. per foot!